This is a new series I like to call, Young Guns. I will look at the youngest, best, and most promising player on each team. This series will not be every day. I could put two up on the same day, zero in a week, or nine in three days. So I’m going to start with the Boston Red Sox. Dustin Pedroia is 25 years old. He went to Arizona State. 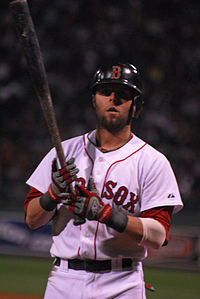 Pedroia was drafted by the Red Sox in the second round with the 65th pick of the draft in 2004. He has a carer batting average of .313, with 27 home runs, 140 RBI’s, 213 hits, and 27 stolen bases. He also has a .989 fielding percentage at second base (his primary position) and shortstop. In 2007 Peedie won a World Series Ring and a Rookie of the Year trophy. That season Pedroia batted .317, with 50 RBI’s, eight home runs, 165 hits, and seven stolen bases. In the postseason he batted .283, with two home runs, ten RBI’s, and 17 hits. In 2008 Pedroia started at second base in the 2008 All Star Game at Yankee Stadium. In 2008 he batted .326, with 17 home runs, 83 RBI’s, 213 hits, and 20 stolen bases. That year Pedroia won a golden glove, a silver slugger, and the 2008 A.L. MVP. In the playoffs he batted .233, with three home runs, ten hits, two stolen bases, and six RBI’s. Pedroia carer postseason stats are a .262 batting average, five home runs, 27 hits, two stolen bases, and 16 RBI’s. Pedroia is a great guy in the clubhouse. he is very cocky saying stuff like, “Strongest 180 pounder in the league.” He and Red Sox manager, Terry Francona play games of cribbage in the clubhouse on road games. Click here to learn more about cribbage. Pedroia doesn’t have the body of a baseball player at all. He weighs 180 pounds and is five foot nine inches. Did you know that Pedroia is the nephew of Phil Snow, the Detroit Lions linebacker? On January 9, 2009, Pedroia was named cover guy for MLB 09: The Show. This offseason Pedroia signed a six year, $40.5 million dollar contract. Pedroia will have a great carer and maybe will 100% make it in to the hall of fame. I think Pedroia will get 3,000 hits. First- Sorry I didn’t blog the past few days, I had a ton of home work. Second- Wow. A lot of news since I haven’t been blogging. Roco Baldelli signed with the Red Sox on a $500,000 with some performance incentives. Roco played for the Tampa Bay Rays last year. Roco grew up in Rhode Island only 50 miles away from Fenway Park. Baldelli will probably be the forth outfielder unless the Red Sox trade Jacoby Ellsbury for catching help. Which sadly means if that happened Jason Varitex wouldn’t be coming back. Baldelli had rare mitochondrial disease, but got an update and the disease he now has is highly treatable. Baldelli will wear number five. The first Red Sox since Nomar Garciaparra. Baldelli is 27 years old. This year Baldelli won the Tony Conigliaro award, given to the player that overcomes adversity. Baldelli has been know for his strong character, spirt, and is a great influence in the clubhouse. Brad Penny officially became a Red Sox today, on a one year deal. He passed his physical and will join the rotation in spring. Penny was an all-star in 2006 and 2007 with the Dodgers. In 2008 he was hurt. Penny will get payed $5 million dollars plus performance incentives up to $3 million. Penny is 30 years old. Brad Penny has a carer record of 94-75, a 4.06 ERA, and 1,032 strikeouts. The Red Sox rotation is now set, Josh Beckett, Jon Lester, Dice-K, Tim Wakefield, Brad Penny, and Jon Smoltz by June (more on him in a second). Penny spent nine years in the National League before joining the Red Sox. Jon Smoltz signed the offer sheet from the Red Sox. The deal is worth $5.5 million plus incentives which could bring the total to $10 million dollars. Smoltz will not be able to play till June. Smoltz is 41 years old and has played with the Braves his whole carer, 21 years before joining the Red Sox. Smoltz has a 210-147 carer record, a 3.26 ERA, 3,011 strike outs, and 154 carer saves. One thing is will he start or be in the pen. I think Smoltz would be the ultimate setup man in the Boston bullpen. Takashi Saito signed with the Red Sox on a one year deal with a club option for 2010. I found this out when I was working on this entry. Saito was the Dodgers closer last year and will now be a setup man/ back up closer. Saito was hurt for most of 2008. Satio’s deal is worth between $1.5 million and $2.5 million. He could earn up to $7 million if he does all of his incentives. Saito is 38 and will join Manny Delcarmen, Hideki Okajima, Justin Masterson and maybe Jon Smoltz in a great Boston bullpen. Saito will also join Dice-K and Okajima as three Japanese born players on the same team. Mark Kotsay resigned with the Red Sox on a one year, $1.5 million dollar deal. The deal would also include incentives that are unknown. Kotsay was a vital clog during the Red Sox postseason run last year. When Mike Lowell went down, Youk moved to third and Kotsay who plays outfield most of the time moved to first. Last year in 22 games for Boston Kotsay hit 19 hits, zero home runs, 12 RBI’s, and had a .226 batting average. Kotsay has played 12 years with the Marlins, Padres, A’s, Braves, and Red Sox. Kotsay had zero errors in the outfield and one error at first base last year. I hope the next move I get to blog about is Jason Varitex resigning with Boston. First- WOW! Today is the slowest day in sports ever. So slow I was going to put this story up around spring training. Second- Some of my NFL predictions were off, but who would have thought that the Chargers would have beat the Colts. Third- My Celtics better start another streak. If they win tonight against the Knicks it will be a two game win streak. Who will win the A.L. will it be the Rays, Sox, or that team in New York (I’m to mad at them for some reason to say their name). I will lock at every thing from the players to their ballparks to their fans. The Yankees have two real aces along with one ace. To be a real ace you have to be an ace no questions asked. To be an ace you only need some people to think your an ace. C.C. and A.J. are real aces while Wang is just an ace. The Red Sox have three real aces being Beckett, Lester, and Dice-K. They also have an ace being Brad Penny. they Rays have two real aces being Shields and Kazmir. Garza is an ace while Price is a future ace. Joba needs to stay in the bullpen so if I were the Yankees I would get Smoltz or someone and move Joba to the ‘pen. The Red Sox need to have a sixth man ready like Clay or Masterson in case Penny or Beckett gets hurt. I would start Clay in the bullpen at first. Masterson should stay in the bullpen. Bowden needs half a year then the Sox should call him up in the summer. The Rays just need to get better every year. Their rotation is great, just not ready to compete with the rotations of Boston and New York. Note- If a “/” is in front of their name then they are the “sixth” or backup starter. If they are bold that means they are one of the top five starters, which gives their team a point. If underlined then they are an honorable mention and gives their team 1/2 a point. Sorry not showing much love to the Rays. First- Here is the link to the salaries that I used for the roster game. try it if you want, it is kinda fun. It only has the salaries from the start of the season, so now Masterson or Price. Second- My Celtics got back on track by kicking the Sacramento King‘s but. The Boston Herald is reporting that the Red Sox have reportedly reach a deal with starter Brad Penny and catcher Josh Bard. Penny’s deal is worth a base salary of five million dollars plus bonuses. Penny is a nine year major league veteran. Penny has played all nine years in the N.L. with the Florida Marlins and Los Angeles Dodgers. He was injured most of the season last year making only 17 starts with six wins and nine losses. With the exception of 2008 Penny’s stats are better then A.J. Burnett’s who recently signed with the New York Yankees, the Red Sox rivals. In 2007 Penny had 16 wins while Burnett had ten wins and eight loses. Penny will be the fifth or forth man in the rotation. Clay Buchholz, Justin Masterson, and Michael Bowden where also in the running for the fifth man in the rotation. I think Clay, Masterson, and Bowden will still compete for the rotation in case Penny gets injured. Masterson will probably stay in the bullpen now, while Clay could start the season in the bullpen to see how he does back at the major league level. Bowden will probably stay in AAA for half the season then move to the majors in the summer. Josh Bard played seven games for the Red Sox in 2006 trying to catch knuckle baller, Tim Wakefield, allowing ten pass balls. Bard must have learned to catch a knuckle ball because I don’t think he would be back here unless he knows how to catch Wakefield. Bard’s contract is worth 1.6 million with a non-guaranteed major league deal. Bard has played seven major league seasons with the Cleveland Indians, Boston Red Sox, and San Diego Padres. He is 30 years old, with 28 carer home runs and a .265 carer batting average. He had one home run and 36 hits, in 57 games with the Padres this year. Bard has been to the post season only once where he went one for seven. Overall I like both moves by the Red Sox, mostly the Penny deal. Jed Lowire, Justin Masterson, Jon Lester,and Dustin Pedoria. that as a baseball fan.